One of the core factors driving physician stress levels and physician burnout in the USA is the CHAOS in the healthcare marketplace. What used to be a simple world of seeing patients and billing insurance has morphed into EMR's, Meaningful Use, Volume to Value, MACRA, the Affordable Care Act and a blizzard of mergers and acquisitions that have turned even the average 50 bed hospital into a major physician employer. Independence and autonomy are out the window and who knows what Big Brother will demand of us next. It is hard to feel certain about the future when your crystal ball has gone dark. It is hard to feel confident about your practice and your career when you are getting a paycheck from the third different organization in the last 6 years -- as the big fish gobble the little fish in many market places. A very similar perfect storm of accelerated change happened in the US military in the 1990's when guerrilla tactics and crazy things like IED's and body bombs displaced orderly tank battles on the modern battlefield. After all, how do you feel confident as a commander in the field when you never know what is coming around the next corner. Healthcare is a VUCA environment for sure. 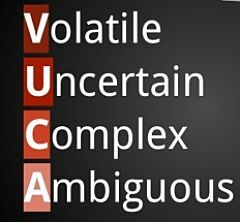 VUCA is bad enough, stressful enough, confusing enough already and now we get the force magnifier of Donald Trump's election as POTUS #45. Quick Question - Does Trump's election increase or decrease VUCA in the healthcare marketplace? Feels to me like literally throwing gasoline on a fire. Does the potential imminent destruction of the ACA, and the prospect of 20 million American citizens losing health insurance they only recently gained, make things easier for the average physician in America? Does this new infusion of chaos raise or lower your stress levels as a doctor? The adoption of EMR, the brave new world of MACRA and all of its pressures to redefine medical practice will most likely continue to roll out across the country. These programs are buried in the government infrastructure at a level where the president rarely tinkers. Even amendments to the ACA would be welcomed by both sides of the aisle. No one has ever claimed the provisions of the act are perfect or even complete. My prayer is that Trump's actions are not actually in alignment with his rhetoric -- that the Republicans with conscience who will fill his administration won't jerk the rug out from under the newly insured members of our society by repealing the act without a reasonable replacement. Whatever happens I also pray that it happens QUICKLY. Please don't let this battle drag through years of muck slinging while the patients and physicians swing in the breeze. 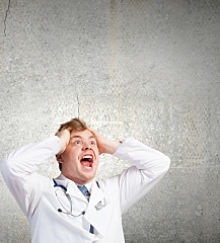 There is only so much VUCA even physicians can take! 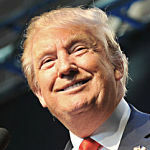 What effect does the election of Donald Trump have on your stress level and how do you think his call to repeal and replace the ACA will play out?